If you remember the movie Innerspace with Martin Short, Meg Ryan and Dennis Quaid, you'll recall that they shrunk down their submarine, got injected into Martin Short, and zipped around through the bloodstream with amazing ease. Like many other aspects of the movie, it just doesn't work that way. For a bacterium, moving around at the microscopic scale is like us trying to swim through something "thicker than molasses." So how do they do it? Bacteria evolved the "highly sophisticated flagellum." A molecular motor that "pumps protons across the cell's membrane causes the helical filaments of the flagellum to rotate" at speeds up to 1,000 rpm. So how are nanobots supposed to imitate this very effective method? 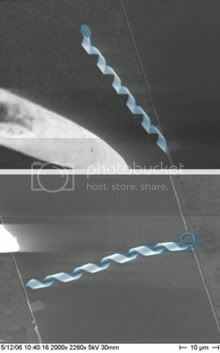 Researchers have developed a novel form of propulsion for microrobots that mimics the way bacteria zip about using corkscrew-like appendages called flagella. Tests show that the tiny rotating nanocoils--just 27 nanometers thick and 40 micrometers long--are capable of spinning at 60 revolutions per minute and that it is possible to propel an object at nearly 5 micrometers per second. Nelson's nanocoils generate their motion using an external rotating magnetic field which causes them to move in much the same way as flagella. The nanocoil was made by fabricating two very thin strips of gallium arsenide on top of each other, using photolithographic techniques; the bottom layer is laced with indium. "The indium atoms in the lower layer induce a compressive stress," says Bell. This causes it to curl up into a helix to release the stress, says Bell. "It's like a corkscrew," Nelson explains. I'm telling you, there'll be nanobots in your blood sooner than you think. Keep up with the latest by coming to this web site every day.